Parents Henry and Eleonora Raabe (pronounced Robby); sister Marion [Zieglemann]. Born on Sept. 2, 1915, in Watertown. Growing up on his family farm outside of Watertown, town of Farmington, Raabe grew to the height of only 4-feet-7 inches. Died April 9th in Orange Park, Fla., at 94, at the Penney Retirement Community in Penney Farms, Fla., where Mr. Raabe had lived since 1986. At the time of his death Mr. Raabe was one of a handful of surviving Munchkins from the film. After graduating from Johnson Creek High School Raabe went to the former Northwestern College in Watertown for four years. He paid for his first year of college by selling the rabbits and ducks he and his sister had raised. After that he spent his summers working at the Chicago World's Fair Midget City. After Northwestern he went on to the University of Wisconsin-Madison where he graduated with an accounting degree. With his ability to speak German he found a job at Oscar Mayer in Madison. He soon heard that MGM Studios was making a movie starring Judy Garland and was looking for lots of little people to play roles in the film. After being featured for all of 13 seconds in the classic 1939 movie “The Wizard of Oz” Raabe came back to Wisconsin and for more than 30 years worked as "Little Oscar" a marketing representative for Oscar Mayer. He traveled the country in the Weinermobile selling Oscar Mayer products and during one of his travels he met his wife Marie, another little person. Raabe became a member of the Civil Air Patrol. After many trials and tribulations he received his pilot's license and worked as a ground instructor during the war teaching navigation and meteorology to young students. During that time he said he flew every kind of single-engine airplane made. 1939 August. Meinhardt Raabe, “Little Oscar” on bumper of Weinermobile, at the premier of the film The Wizard of Oz in Watertown. He was here for an in-person appearance at the Classic Theater on Main Street. After life as Little Oscar and the Munchkin Coroner he went on to receive a degree in horticulture which his sister said she believes is his passion in life. His life's journey of growing up on his family farm outside of Watertown, going through college, searching for a job, becoming Little Oscar for Oscar Mayer and playing a role in "The Wizard of Oz," is portrayed in his autobiography book "Memories of a Munchkin: An Illustrated Walk Down the Yellow Brick Road," by Raabe and co-authored by Navy Lt. Daniel Kinske. Meinhardt Franz August Raabe was born on Sept. 2, 1915, son of Henry H. and Eleonora Mina (Rummler) Raabe. He was baptized and confirmed at Immanuel Lutheran Church in Farmington and remained in contact with the church and the community all of his life. 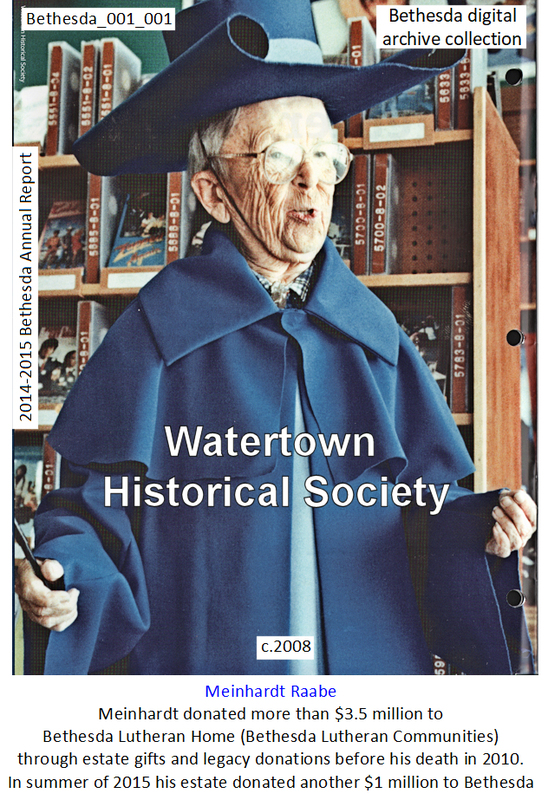 Meinhardt graduated from the eighth grade at Maple View School, a neighborhood, one-room schoolhouse. He was a graduate of Johnson Creek High School and attended the former Northwestern College in Watertown for three years. He then transferred to the University of Wisconsin-Madison and graduated with a degree in accounting in 1937. While seeking higher education, summers were spent at world fairs and expositions to earn tuition money for the next school year. Meinhardt went on to receive an M.B.A. from Drexel University in Philadelphia in 1970. In June 1937, he began working for the Oscar Mayer Company in accounting and then as “Little Oscar,” promoting their products. Then in November 1938, Meinhardt took a leave of absence to film “The Wizard of Oz” and was cast as the Munchkin Coroner. He then returned to the Oscar Mayer Company and continued his career, billed as the World's Smallest Chef, traveling with the Weinermobile promoting Oscar Mayer products. He worked a combined 30 years for the company. Meinhardt received his private pilot license in 1944 and joined the Civil Air Patrol in 1945 as a ground instructor, teaching navigation and meteorology. He had also taught school in Delaware, Pa., and worked in various capacities for other food brokerage firms as well. Meinhardt married the former Marie Hartline on Dec. 15, 1946, in Akron, Ohio. She preceded him in death on Oct. 22, 1997. 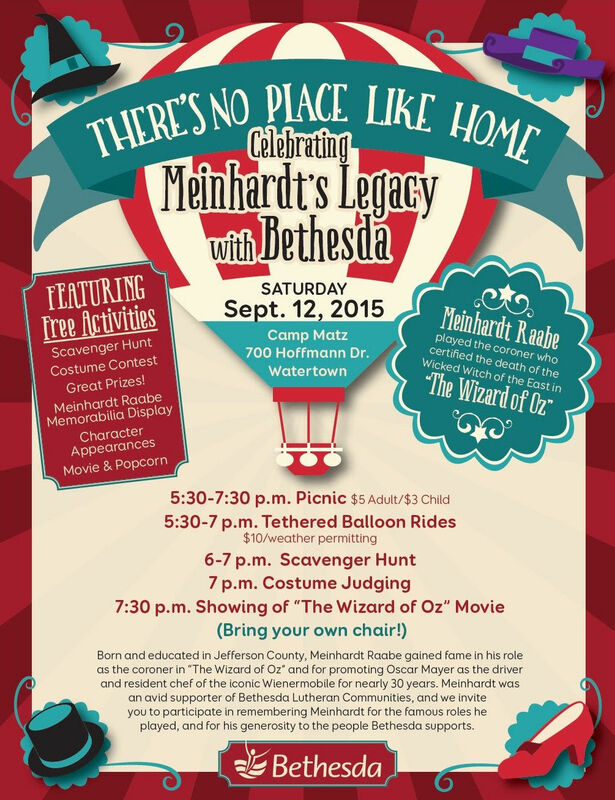 As “The Wizard of Oz” gained popularity, so did Meinhardt and the other remaining Munchkins. 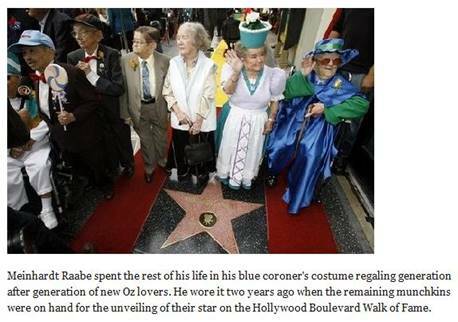 He appeared at Wizard of Oz Festivals throughout the country and was present when the Munchkins were honored with a star on the Hollywood Walk of Fame. Meinhardt co-authored a book, “Memories of a Munchkin” with Lt. Daniel Kinske, USN. He was a member of Little People of America. 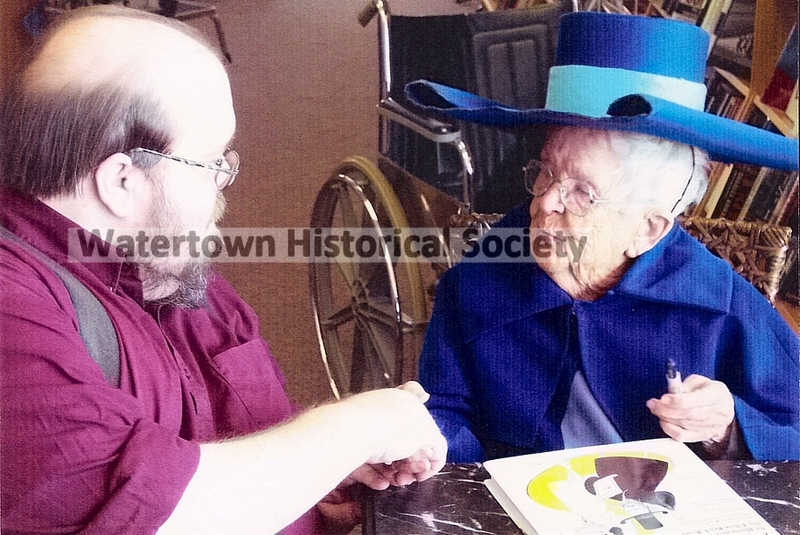 He is survived by a sister, Marion Ziegelmann of Watertown; other relatives and friends. Meinhardt was also preceded in death by his parents. Having pursued a two-year course in accounting in the commercial classes of Northwestern College, Meinhardt Raabe, who is one of the inhabitants of the Midget Village at the World's Fair gladly cooperated today (June 22nd) with Dr. C. W. Dupertius, of Harvard University in a bit of scientific research. The doctor, who is director of the Anthropometric Laboratory in the Social Science Hall, measured the heads and bodies of the midgets for the purpose of comparing the statistics with fully grown adults. Meinhardt, a resident of Johnson's Creek, Wis., is 48 inches tall, weighs 58 pounds and is crazy about tennis. 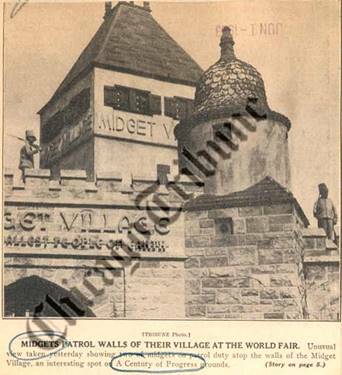 Meinhardt Raabe, the 19-year-old midget at Northwestern College, is back at his studies here following almost four months in the Midget Village at the World Fair. Meinhardt, who is only 48 inches tall, and a son of Mr. and Mrs. Henry Raabe, Johnson Creek, route 1, entered the village on May 20 and remained until just a short time ago. He would have liked to stay longer, but he already had missed two weeks of school work and felt he should return to his studies. While in the village, Meinhardt had three different jobs. When he arrived, he was placed on the "barker" stand, where he stood for several hours each day urging, in the usual professional lingo, fair goers to see the sights in the village. After serving as barker for a couple of weeks, he was assigned to a bookkeeping position at one of the restaurants in the village. There his job was to keep track of what the midgets ate. The restaurant, as well as other concessions on the grounds, was operated privately, but the meals the midgets ate were paid for by the "boss," S. Graham. After seven weeks of this kind of work, Meinhardt was placed in a souvenir stand. "Of the three jobs, which did you like the best," a Daily Times reporter asked him when he was being interviewed in one of the news rooms on the second floor of the Times' building. With a flash in his eyes he quickly replied, "I liked the bookkeeping job the best." And this was only natural, for Meinhardt is taking a business course at the local college. 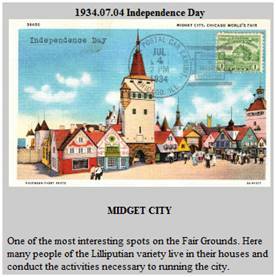 Nearly every country in the world was represented by midgets in the village, Meinhardt states. There were midgets from Sweden, Scotland, Austria, Hungaria, Ireland, Italy, France, Poland, Russia, England, Germany and so on. When asked how many midgets there were at the village, Meinhardt did not give an immediate answer. "That all depends on how you figure it. By actual count there were about 100 midgets on the grounds, but according to the press releases, there are 150." Germany was represented by a professional troupe of midget dancers and entertainers considered to be the finest in the world. This year all the concessions were operated by outsiders, renting the space from the owner of the village, Mr. Graham. Last year Mr. Graham ran all the concessions himself, but with the village larger and many more other things to take care of, Mr. Graham leased the concessions. A large number of the midgets, however, were employed in the stands. The stage performances were in charge of N. Eagle. Meinhardt also found that people are poor judges of height. "The smallest man in the world was supposed to be one of the features of the village. The public was told that he was 18 inches tall." Actually, Meinhardt states, he was 25 or 26 inches in height. When people saw him they actually thought he was 18 inches in height. Strictly speaking, Meinhardt states he is not a midget at all. He found that a real midget is not more than 42 inches in height. He is 48 inches tall, so technically speaking he is out of the midget class. About half of the midgets were not professional, he says; that is, they did not earn their livelihood by virtue of the fact that they are much below normal in height. A postmaster from a town in Michigan was at the village during the summer; a midget who ran a big dry cleaning establishment in Texas also was there and a real estate man and his wife from New York also were present. During his stay at the fair, Meinhardt broadcast twice — once over WGN in Thompson's restaurant at the fair and another time over WCFL in the administration building. Each time he told the world about the Midget Village. Meinhardt not only found his almost four months at the fair educational but a real experience. Financially, the summer was a success also. "I earned enough money to pay my board and room at the college, and that's more than I could have done if I stayed home." 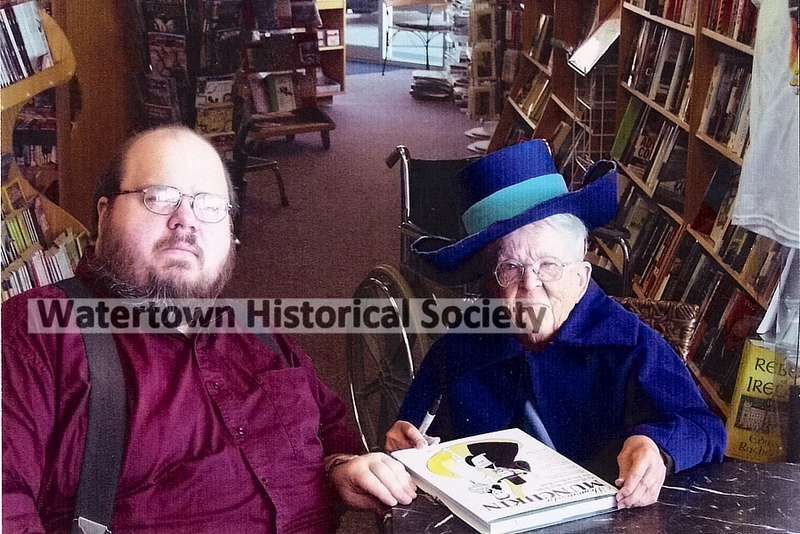 Meinhardt Raabe, who during his student days at Northwestern college became known as the Northwestern college midget, was in Watertown yesterday, enroute with his wife from Ashley, near Wilkes-Barre, Pa., to their home in Wausau. They were among those who attended the wedding of two other midgets, Mrs. and Mrs. Jospeh Kotalik, which was solemnized in Holy Rosary church in Ashley last week. More than 2,000 persons attended the wedding, which also included many of the “little people” from different cities. The Daily Times published a photograph of the wedding party in its issue on Tuesday of this week . . . Mr. and Mrs. Raabe were among six midgets who attended the couple at the wedding . . .
. . . Mr. Raabe told the Daily Times that the wedding was an event he and his wife would cherish a long time. His wife, the former Marie Hartline, and the bride appeared in shows together and both the bride and groom and Mr. Raabe appeared together at the Midget Village at the Chicago Century of Progress exposition. Mr. Raabe, who now is a salesman, with headquarters at Wausau, is employed by a food brokerage concern. He travels as a salesman throughout northern Wisconsin and Upper Michigan. He formerly worked as a salesman for the Oscar Mayer Co. of Madison and Chicago. He attended Northwestern college and then went to the University of Wisconsin where he majored in business and accounting. He received his B. A. degree from the university. Some years ago he went to Hollywood to appear in the film “A Wizard of Oz” with Judy Garland and Bert Lahr. He is a son of Mr. and Mrs. Henry A. Raabe of Johnson Creek. He and his wife reside in Wausau at 1016 ½ South Fourth Avenue. Mr. Raabe drives a standard car, which is equipped with special attachments which enable him to operate it. He likes driving, but says the highways are getting too unsafe for comfort and that the territory he covers has had a lot of snow and driving conditions have been rather hazardous this winter. He mentioned many of his old classmates at the college here and says he would like to be remembered to his teachers and professors. Whenever he has time he looks some of them up, but on this trip he was in too much of a hurry to spend time here. He said he and his wife had been away from home for over a week and they had to get back home and he was preparing to resume his business on the road. They like Wausau and the people there. But he always finds a warm welcome in Watertown and enjoys coming here, he said. He posed [for the accompanying picture] at the Daily Times yesterday. Not until he had left did the Times learn that his wife was waiting in their car not far from the Times building. Had this fact been disclosed earlier, she too would have been in the picture. She is as cute as a little doll. William F. Jannke III with Meinhardt in 2006 at book signing at Books & Co. in Oconomowoc. 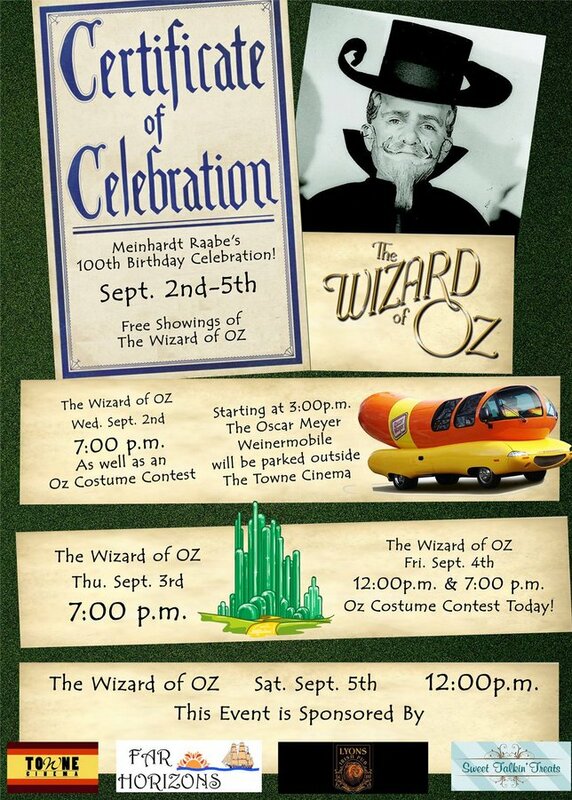 The Towne Cinema will be hosting a four day celebration of the life of Meinhardt Raabe, who was the Munchkin Coroner in “The Wizard of Oz” with free showings of the iconic movie to coincide with the 100th anniversary of Rabbe’s birth. Raabe was born in Watertown, raised in Farmington, went to high school in Johnson Creek, attended the former Northwestern College in Watertown and went on to graduate from the University of Wisconsin- Madison. There will be four free showings of the “Wizard of Oz” on Wednesday, Sept. 2 and Thursday, Sept. 3 at 7 p.m., Friday, Sept. 4 at noon and 7 p.m. and Saturday, Sept. 5 at noon. On Sept. 2 before the 6:30 p.m. showing there will be a birthday cake celebration. Sept. 2 would have been Raabe’s 100th birthday. He was born in 1915. A birthday cake with 100 candles along with some group singing will take place. One hundred cupcakes from Sweet Talkin’ Treats will be given away in honor of Raabe. Oz costumes are encouraged. The Oscar Mayer Weinermobile will be in attendance at the event on Wednesday. Raabe toured the country for 30 years in the Oscar Mayer Wienermobile, promoting hot dogs as Little Oscar, the Worlds Smallest Chef. He retired in 1971. A celebration of Raabe’s 100th birthday brought around 200 people to Towne Cinema on Wednesday night the see the Oscar Mayer Wienermobile and a free showing of the iconic movie. 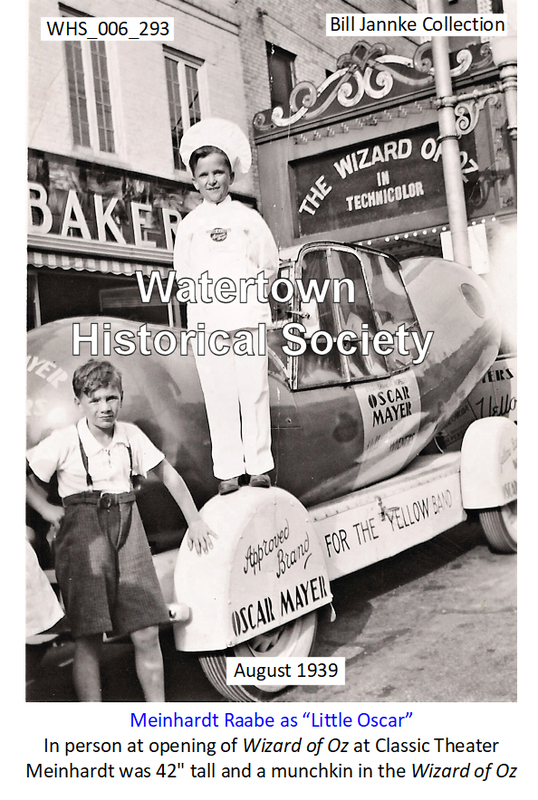 The historic theater was the right setting for a mini museum featuring photos of Raabe from the Watertown and Wisconsin Historical Societies and with the iconic hot dog parked outside nostalgia was alive and well in Watertown. The centerpiece of the event was a large tornado fashioned from cotton, which reached the ceiling, a yellow brick road and guests dressed up in their best costumes. The role in the film brought Raabe international fame and was a huge presence throughout his life. After the film according to his book, “Memories of a Munchkin,” published in 2005, he was a pilot and an instructor in the Civil Air Patrol during World War II, continued his work as the “World’s Smallest Chef,” was a horticulturist and teacher as well as during later years toured fan conventions. DEERFIELD — When the restoration work is finished this month, the vehicle that has been turning heads for decades will no longer be road-worthy. There will be no gas tank, transmission, brake lines or side-view mirrors. The General Motors straight 6-cylinder engine will be junked and the four Goodyear tires filled with a hardening foam to prevent flats. The days of taking the “Old Number 7” Oscar Mayer Wienermobile for a ride are over. It’s about to become an immersive and accessible museum piece and forever serve as a reminder of Madison’s role with an iconic, homegrown company that pumped out millions of hot dogs, slices of bologna and packages of Lunchables. The fleet of six Wienermobiles from Oscar Mayer’s parent company, Kraft Heinz, still roams the country touting the brand and showing up at fairs, parades, festivals and promotional events. The $50,000 Wienermobile restoration is an effort by the Wisconsin Historical Society, Wisconsin Historical Foundation and the Mayer family, which is funding the project (along with a $15,000 endowment for continued maintenance of the vehicle), to preserve a reminder of Wisconsin’s manufacturing heritage. Over the years, the historical society has acquired multiple items from Oscar Mayer and Kraft Heinz. They include toy wiener whistles, ice picks, packaging and work clothes. There are two types of shovel, one stainless steel for moving meat and one plastic yellow used for removing meat that may have fallen to the floor and was no longer edible. The items will ultimately be stored in the nearly completed $46.7 million, four-story, 188,733-square-foot archive preservation facility for the Wisconsin Historical Society and the Wisconsin Veterans Museum at 202 S. Thornton Ave. Some will be displayed at times at the Wisconsin Historical Society Museum on Capitol Square, but the Wienermobile is too big for the museum so it will be relegated to being parked outside the museum for special events and shown off at other spots around the state. This particular Wienermobile was built at the Oscar Mayer plant in 1969 on a 1967 Chevy chassis. The 23-foot-long vehicle included taillights from a Ford Thunderbird and four exterior speakers to blare out the famous “I wish I were an Oscar Mayer wiener” jingle, and had a top speed of 45 mph. The square hatches on both the passenger and driver’s side, used to pay tolls, will be sealed along with a roof hatch, from which wiener whistles were thrown during parades. RAABE TOURED OCTAGON HOUSE: Meinhardt Raabe, a graduate of Northwestern College, played the Munchkin coroner in the classic film and pronounced the Wicked Witch of the East, “Really most sincerely dead.” You can read all about it in his recently published autobiography entitled Memories of a Munchkin, written in collaboration with Lt. Daniel Kinske, U.S.N. The book tells of his life growing up in nearby Farmington and Johnson Creek and of his career as “Little Oscar” for the Oscar Meyer Co. Many years ago, one of our guides had the pleasure of giving Meinhardt Raabe and his equally diminutive wife a tour of the Octagon House while they were here for a visit.